Both of these lovely kits have been tested on children and non-felting adults. 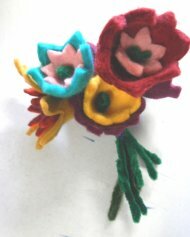 The flower kit has been acomplished by a 6 year old who had never felted before. Several of my grand nieces and nephews in the age range of 8 - 12 have done the bird without trouble. Both kits include instructions and all the materials needed, including lovely silk and glitzy embellilshments for the nesting birds and lots of colors for the flowers. And both kits also include the rolling set so all you need to have is some water, the kids to make them, and some Ivory dish soap!